In your opinion, is a relaxing night out at the cinema a great one? Kinepolis will serve you well! Take advantage of the "Movie Card" to get cheap cinema tickets. The Movie Card provides you 10 cinema tickets to see the movies of your choice. You can use these 10 tickets as you wish: 10 movies on your own, 5 movies as a couple or a movie with your friends or your whole family. Book your ticket(s) for the screening(s) of your choice. It's easy! Youhave 100 days to use your tickets from the date of your purchase. Good news for cinema fans! 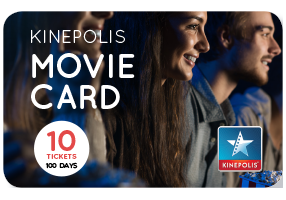 Your My Kinepolis profile allows you to pay for your bookings online with your card number, but also to check - when and where you want - the number of tickets left and their date of validity. Going to the cinema has never been such a bargain! Movie Cards are on sale at the reception of all Kinepolis cinemas. •Valid in Luxembourg Kinepolis cinemas and Ciné Utopia for 100 days from the date of your purchase. •Prices are subject to change. •If you pay with the Movie Card, extra fees will apply for 3D films, films of more than 135 min, Laser Ultra and Cosy Seats. •Your Movie Card is not valid for special events such as ladies' nights, "Burgers, Beer and Blockbuster" nights, operas, etc. •You can buy tickets for "Family at the Movies" with a Movie Card by paying an extra fee of EUR 2 per ticket.